Double X Science: Everyday Science: Why Can You Hear Around Corners But Not See? 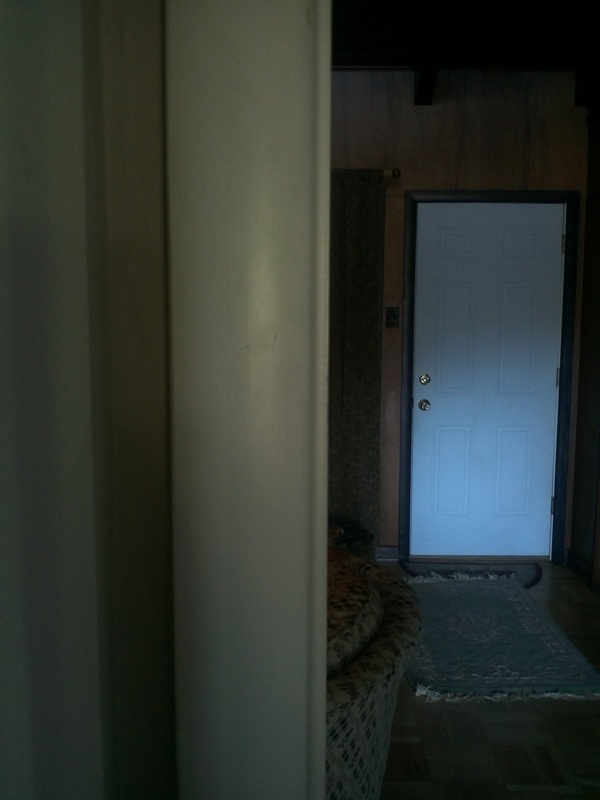 Everyday Science: Why Can You Hear Around Corners But Not See? As I sit and type this in my study, I can hear my cats crashing around the living room, which is around the corner from me. There's a wall between us, so I can't see them or shoot them with my water pistol (which I would be tempted to do if they were in the same room, before they knock over something fragile). So, just like in my earlier post on mirrors, we'll start with a question: why can I hear my cats around the corner, but not see them? Both sound and light are waves, but the way we perceive those waves are very different. I don't just mean the organs we use - eyes and ears do have major biological differences - but how the characteristics of those waves differ. We perceive differences in light through color, and differences in sound through pitch, but in the end these characteristics mean the same thing: they're a measure of how big the wave is. The technical term for this is its wavelength: the distance it takes for a wave to start repeating itself. For visible light, red has the longest wavelength, while violet has the shortest. In between you get the other colors of the rainbow, and if you mix them all together you get white light. Visible light wavelengths are between 400 and 700 nanometers, which is smaller than bacteria (which themselves are smaller than cells in our bodies)! Wavelengths smaller than 400 nanometers get into ultraviolet, X-ray, and gamma-ray territory; wavelengths greater than 700 nanometers comprise infrared, microwaves, and radio waves. For sound, the situation is a little messier, since our ears respond to frequency, not wavelength. The specific wavelength of sound depends on the temperature and humidity of the air, but if we assume dry room-temperature air, a low-pitched sound has a wavelength of about 17 meters and high-pitched sounds have wavelengths around 2 centimeters. That's a big range, and not all those sounds will travel around corners. Shorter wavelengths are ultrasound, which are probably most familiar for tracking the health of fetuses: these sound waves can penetrate or reflect off tissue, and by measuring the waves that bounce back, doctors can track blood flow and other developmental processes inside your body. (X-rays go right through soft tissues, so they're better for looking at bones.) Longer wavelengths are infrasound; animals like elephants use these very low-pitched sounds for communication across long distances. When a wave meets an opening like a door, it can experience something known as diffraction: the wave passing through the opening spreads out on the other side. However, the wave doesn't just come through the center of the door: it makes a bunch of waves along the length of the opening, and those waves actually interfere with each other. The wider the door, the more of these new waves are made. 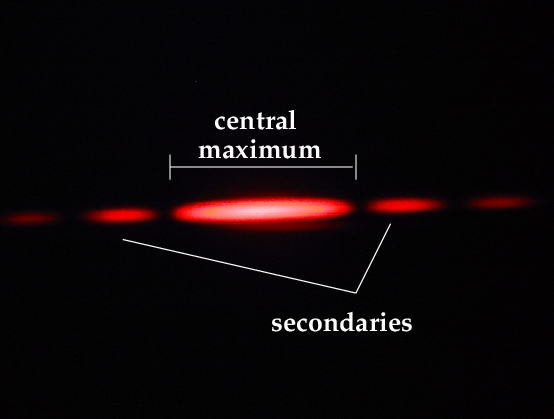 The image to the right shows the interference pattern from a red laser shining through a very narrow opening (smaller than a millimeter). The central maximum is where most of the light coming through the opening ends up, but you also have dark spots where the light interferes and cancels out. The secondary spots on either side of the maximum are much less bright, and you also get tertiary and smaller spots that are fainter still. You get the same pattern for sound, though for obvious reasons I can't show you a picture of it! The only difference is you exchange brightness for loudness, and dark spots for places where the sound is silenced. The width and intensity (brightness or loudness) of the spots depend on the ratio of the wavelength to the size of the opening. 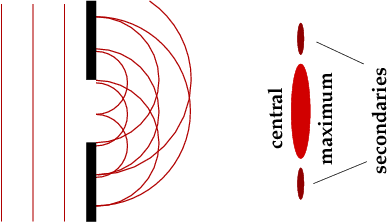 If the wavelength is bigger than the opening, there isn't diffraction; if the wavelength is about the size of the opening, then you get strong diffraction, and the central maximum is a lot wider than the opening. If the wavelength is much smaller than the opening, then the central maximum is quite small, and since the secondaries, tertiaries, and so forth are fainter still, the pattern may be hard to detect. So there's our answer! A typical doorway is around a meter wide (a little less, usually), so sound with its relatively large wavelengths will create a big central maximum and sufficiently-loud secondaries. That can be enough to hear even if you aren't in a straight line with the hooligan cats in the other room. A corner is just a very wide doorway, so everything I've said about doorways carries over to them too. Visible light has very small wavelengths, so while you do get light diffraction through doorways, you'd need a microscope to see the pattern! If you have a strong light shining through the door, you'll get a nice rectangular blaze of light on the opposite wall, but it's not much bigger than the door, and doesn't go around corners. However, if you have a cell phone or a cordless phone, the signal from those definitely can go around corners: those are based on microwaves or radio waves, which have much larger wavelengths than visible light. There is one place where diffraction does play a role in our vision: our eyes themselves. Doorways are too big for diffraction, but the pupil in a human eye is about 2 millimeters across, varying depending on whether we're in a bright or dark place. The size of the central maximum of light cast on our retina is part of what determines how well we see. Diffraction also is why radio telescopes need to be very large, but why an ordinary visible light telescope you might have doesn't need to be huge - yet the larger it is, the more clearly you'll be able to see distant planets and galaxies. The telescope is like a big window, so you want to match the size of the window to the wavelength of the light you're viewing. Now if you'll excuse me, I need to go make sure my cats haven't wrecked the living room. In Grand Central, there is a hallway right outside the Oyster Bar where two people can stand at diagonal corners and, despite being about 20 feet apart, they can hear one another (even while speaking in whispers) if they speak directly into the corner (http://www.localoaf.org/2006/12/30/grand-central-stations-hidden-acoustic-wonder/). How would this work? Additionally, what about the acoustics in the oval office where there are no corners? This is all super cool stuff!!! Thanks for writing a great post! @Jeannegarb: The corners act like a sonic lens, amplifying the sound to and from the opposite corner.